I constantly hear from friends, family and followers how they don't have time to cook, especially on weeknights. So I was happy when I received a review copy of award winning chef, restaurateur and TV personality, Chef Michael Symon's 5 in 5 cookbook. The premise behind this collection of recipes is they all use 5 ingredients and can be ready in 5 minutes. I'll admit the 5 minute part may not be totally accurate but the recipes are very quick none the less. Geared to the busy person that wants quality, fresh food, fast the book offers 120 solid recipes in the following categories: Pasta, On A Stick, Between Bread, Packet Perfection, Eggscellent, Man With A Pan, Let's Grill and I Scream, You Scream. There are no hard to find ingredients or crazy cooking techniques required. Straight up easy, home cooked meals that can be on your table in minutes. 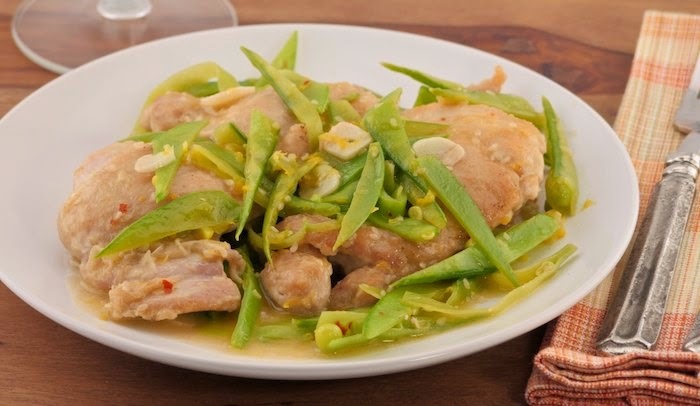 One of the recipes I tried and loved is the Asian inspired Chicken with Snow Peas & Red Pepper. The sauce is a refreshing and light combination of orange juice/zest and crushed red pepper with a small pat of butter added at the end to give it a silky finish. Thanks to the kind folks at Bluestar Cooking I have one copy of this awesome book to give away! Put the flour in a shallow bowl and season with salt and pepper. Season both sides of the chicken with salt and pepper. Dredge the chicken in the seasoned flour, shaking off the excess. Pour the oil into the pan. Add all 4 pieces of chicken skin-side down and cook until golden brown, about 2 minutes. Flip the chicken, add the garlic, sesame seeds, and a pinch of salt, and cook for 30 seconds. Add 1/2 cup water and deglaze the pan, scraping with a wooden spoon to get up the browned bits on the bottom of the pan. Simmer until the liquid is reduced by half, 1 minute. Add the orange zest and juice and red pepper flakes, cover the pan, and cook for 1 minute. Add the snow peas, cover, and cook until slightly tender, about 1 minute. Remove the pan from the heat and add the butter, swirling it around in the pan until fully melted. Taste and adjust the seasoning, adding salt and black pepper as needed. Serve immediately. Handcrafted in Reading, PA since 1880, BlueStar cooking products are designed for discerning home chefs who demand restaurant-quality results in their own kitchens. I just love fresh cooking! I just love fresh cooking- especially when it's easy! This recipe sounds terrific and right up my alley. If the rest of the recipes are this quick and easy, I want this book! I love fresh easy cooking! I love Michael Symons! I watch him on The Chew all the time and I just met Carla Hall yesterday!!! Five minute cooking would be great for me. Awesome! I can't make a sandwich in that! I am a Michael Symon fan and I also love fresh easy cooking! I love fresh easy cooking & Michael Symon. I'm easy. I LOVE Michael Symon, and I salivate over BlueStar products. And I like fresh, easy cooking! Sound's great. Michael Symon is the bomb! I'm a Michael Symon fan! Plus I love fresh cooking! I enjoy watching Michael Symon, but I've not made any of his recipes. I love fresh, easy cooking, so that's why I'd love to win this. I've checked this book out at the library, would love to own a copy!